Liberal. . Wallpaper and background images in the Debatte club. 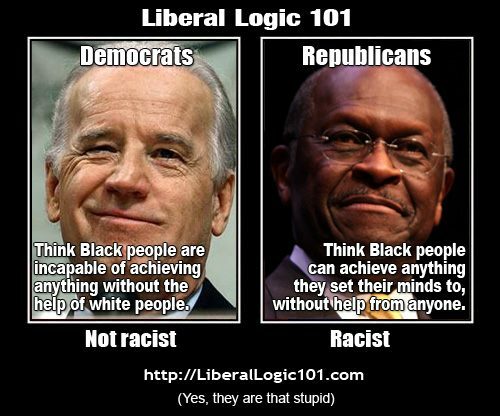 I don't recall anything Biden said on the topic of race, but if you're referring to Cain's statement that racism doesn't hold anyone back in a big way, I wouldn't call that racist, but I would call that ignorant of the institutionalized racism that exists in our society. Yes, one black man rose to be a front-runner in the republican party, and one even became president. But it took until 2008/2012 for these things to happen, and they are still the only ones. Don't even get me started on women in politics (republican, democratic or otherwise). I'm a black Democrat, and I believe that I can achieve things without the help of ANY race! Whoever made this didn't realize that Republicans are mainly interested in overly rewarding the rich with something they already have(money)at the expense of the poor as well as restricting people from personal freedoms that have no affect on others (like gay marriage and abortions) just to keep up with the old Biblical times, while Democrats are interested in giving resources to the poor as much as we can so the poor can have something to really on until they get their lives together as well as granting people their personal rights and freedom and the protection of those rights and freedom after seeing so many times that those freedoms don't hurt anyone. No... That's wrong.. Technically, Obama didn't need help. Republicans, by stereotype are believed to only care for the rich. ivoryphills Did you just say that abortion doesn't affect anyone? Does the future children of the world count as no-one? Oh wait, they won't be future children and leaders of the world because they are dead.